Look at the picture below. What do you see ? You’ll probably say “some pieces of metal”. If you were looking at it for real, you would know where you were, and that might give you some more information, such as “it’s a display in the National Museum of Greece at Athens, with some pieces of metal”. If you read the inscription provided by the museum, you’ll probably add “4th century BCE iron points, Thermopylae”. As you walk around Athens, this is not going to be the only thing you see, not by a long shot. There’s the Parthenon, of course, and the Forum, and many more. You will likely recall the most prominent ones just before drifting off to sleep that night. You will return from your holiday, share your memories with your family and friends, download your million photographs, and gaze wistfully into the distance while you remember some exquisite moment. It’s a pretty safe bet that the iron points have faded from your memory completely – you might as well have never seen them. Which is a real shame. Because what you saw there was something which should have been pretty memorable. 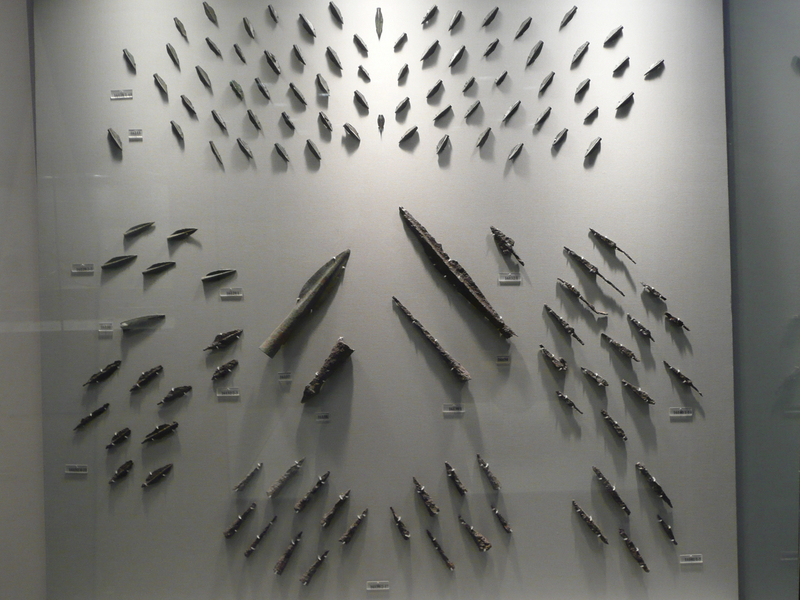 What if I told you that these iron points were the arrow tips recovered from the site of the great battle of Thermopylae between the Spartans and the Persians? You know, the one known so well from the movie 300? So what just happened here? Its called context, its what helps our brain make sense of the world, and, in a way, it’s the raison d’etre for this blog. My early travel experiences were filled with awe and wild eyed wonder, but all the while, my brain functioned pretty much like yours did at the start of this post. Big things registered and stayed – the pyramids, Uluru, Big Ben. But I’m sure I looked at countless other fascinating things, most of which I struggle to recall. So much forest missed for the trees. Enter THE BLOG. Aha ! Now I could collate information in one place online, share my experiences with family and friends, and make a memorable chronicle of my travels. Which basically is what it was – “I went here, I did this, I saw that”. While uploading pictures to the blog however, I realised that there were a million pictures for which I had no memory whatsoever. I couldn’t even tell you where they were taken. Hang on a minute! I did the research ! I trawled through the guidebooks! I hired personal guides at significant places! So what went wrong? What was missing was context. This blog has evolved from the realisation that context matters. Not lengthy, pedantic, factual overdoses, but the story. Everything we look at, every object, every place, even every person, has a story. It’s the story that makes what we are looking at interesting, relevant and memorable. We may forget facts, we may forget details, but we never forget a good story. Its how we are wired. As David Mamet says, “The audience will not tune in to watch information. The audience will only tune in and stay tuned to watch drama”. Not every story can be told, that’s neither possible nor practical. But some deserve to be. I hope you find many such stories as you wander around the pages of this blog, and hopefully, experience the awe I now feel when I stand in front of something that looks insignificant but I know is not. That’s Dyscover 24×7, version 2.0. The mad dash to see it all has been tempered with patience. The frenetic diarizing has given way to looking with the mind’s eye and the heart’s touch. The flowery, hyberbolic descriptions and litany of enumerations have given way to pithy storytelling. A few caveats. Opinions differ, facts change, weather is unreliable. Think of this more as a road map – check all necessary conditions before you set off. So sit back, relax, and let me tell you a story…..